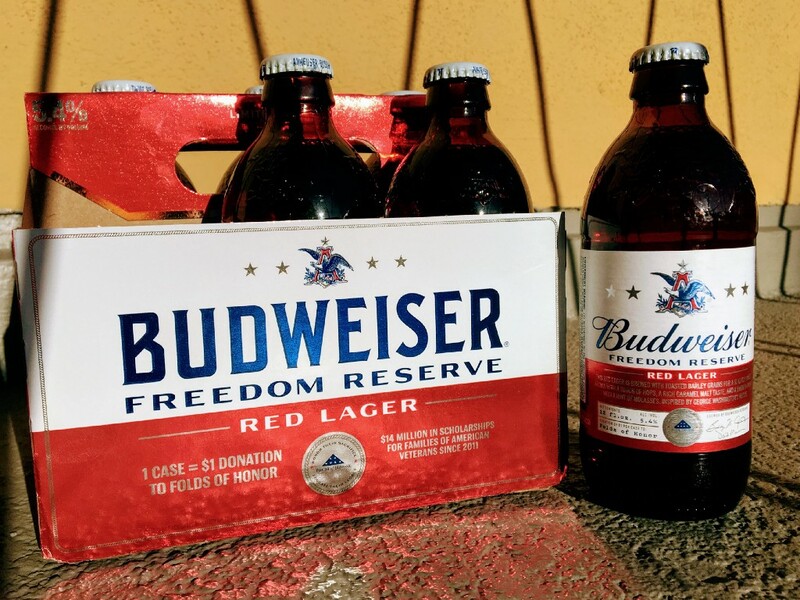 Just in time for the Fourth of July, Budweiser has released a special-edition beer called “Freedom Reserve,” allegedly inspired by George Washington’s own homebrewed beer recipe. The lager is a ruddy shade of brick-red, which builds up a nice inch-wide head of golden foam in the glass. You smell caramel, oats and warm spices as you raise up that glass for a sip. The sip itself tastes like an intriguing blend of malt and honey before it all disappears in a watery flash, leaving flavors of flour and a bit of that typical cheap-beer acidity you taste in Bud Light. Budweiser’s mediocre Freedom Reserve would be the best beer Washington could have ever tasted, if we could send some back in time. But more importantly, it’s nothing like any beer Washington drank. Such marketing ploys are to be expected from the biggest beer brand in America, which made waves, and caught plenty of flak, for labeling cans with the word “AMERICA” during the summers of 2016 and 2017. Budweiser is the company that has intertwined its watery lager with iconic American imagery of military veterans, regal Clydesdale horses and the repeal of Prohibition. The irony, of course, is that Budweiser is no longer an American company — Anheuser-Busch, the original brewery that first began selling Budweiser in 1876, has been a subsidiary of the international Belgian-Brazilian corporation AB InBev for the last decade. No matter, as selling the cult of Americana around beer is a tradition nearly as old as modern American beer production itself. The beer industry is worth more than $350 billion in the U.S., per the 2016 report from the Beer Institute and National Beer Wholesalers Association, and beer remains the most popular alcoholic beverage in the country, especially with men (62 percent of men prefer beer over other options, compared to just 19 percent of women, according to Gallup polls). Despite the surge of the craft-beer movement, the four most popular brews in the U.S. continue to be Bud Light, Coors Light, Budweiser and Miller Light. Yet it wasn’t so long ago that these light lagers were considered suspiciously un-American, and a signifier of an immigrant population that concerned white Americans in the 19th century. And without the impact of mass migration from Europe, it’s likely that beer wouldn’t be America’s drink at all. During Colonial America of the 1700s, beer was an afterthought compared to liquor and wine, which dominated the taverns of the time, says Michael Stein, president of beverage research firm Lost Lagers and an expert on historical beer styles. There’s evidence Washington drank dark porters and strong ales in the English style, ordering from small brewers who learned the craft from across the pond, but nothing like the pale lagers popular today, Stein says. The trouble was that the cultivation of barley (the main fermentable ingredient in beer) and hops (the greenish flowers that provide flavor, aroma and bitterness) hadn’t yet been developed in the New World. Indeed, Budweiser’s Freedom Reserve is based on Washington’s handwritten recipe for a “small beer,” a cheap kind of brew with very low alcohol content (around 1 percent) that was largely intended for the troops during the Revolutionary War, which raged from 1775 to 1783, according to historians. Small beer also was consumed by servants, slaves and children, and its flavor was dominated by molasses, which would have covered up any bad flavors from a fast fermentation. The beer landscape in America didn’t experience a sea change until the mid-1800s, when political strife in a number of German states, plus diminishing opportunities for land ownership and economic growth, pushed waves of Germans to cross the Atlantic and resettle in American cities. Unlike their British counterparts, Germans were drinking lagers — made with a different brewing method and yeast that created a fizzy, bready, golden beer. Still, even this lager didn’t quite capture the attention of most American drinkers, who likely found it too bitter and intense, according to research from Maureen Ogle, author of Ambitious Brew: The Story of the Immigrants and Entrepreneurs Who Invented American Beer. The most important pivot in terms of flavor was the introduction of rice and corn, two New World crops that German brewers discovered was abundant in America. “The introduction of corn and rice into the recipes was a way to lighten the character of the beer. The common [understanding] of that was that it was a way to save money and use cheaper ingredients. Maureen’s premise, which she makes with a lot of conviction, is that it was actually their way of addressing the palate of the American drinker, as opposed to the palate of the German drinker, or the Austrian drinker,” says fellow beer expert Stephen Beaumont, co-author of The World Atlas of Beer. The mellow lagers cut with rice and corn turned out to be a big hit, and Americans drinking them consumed three times as much beer as their German immigrant counterparts, according to an 1877 report from the New York Times. One of these sweeter beers was Budweiser, first introduced to the American market in 1876 by German-born Adolphus Busch. He, alongside other aspiring businessmen like Frederick Pabst and Joseph Schlitz, looked to the lessons of robber barons like Andrew Carnegie to understand how to grow their business and dominate the industry. The construction of national rail lines and the advent of refrigeration technology opened a door for these immigrant men, who sought to transform a patchwork of small community breweries into a streamlined network to bring their beers to the American masses. Prohibition was the death knell for a swath of small breweries, but the biggest companies survived by redirecting their transportation and refrigeration resources to other products like ice cream and tonic, McCulla notes. And once the ban on alcohol was repealed, the business landscape had changed. Now, a company like Anheuser-Busch had more room in the market to flex its will, especially as American drinkers moved from the tavern to their living rooms amid the rise of bottled and canned beer technology. “It’s in the wake of Prohibition’s repeal and the rise in mid-century mass marketing that you start to see beer marketed as the drink of the everyday, working American — and American man, at that,” McCulla says. The modern marketing around American beer has neglected the stories of not just German immigrants but also the role of migrant workers, primarily Native Americans and Chinese Americans who picked hops across the country during the pre-Prohibition days. And Budweiser’s touting of George Washington as a homebrewer also leaves out an important detail: He likely was never involved beyond the recipe. “Crucial to note is that ‘small beer’ of the era was brewed by women and/or enslaved people, depending on the household. Much of what you read online likes to tout George Washington and Thomas Jefferson as America’s original homebrewers. In truth, others were brewing, and the founding fathers were drinking,” McCulla says. In that sense, there may be nothing more quintessentially American than beer, the immigrant product with a winding history of power, struggle and politics, all wrapped into a little brown bottle.